Chrichton's World: Review The Hard Way (1991): Underrated action comedy and a true classic if you ask me! 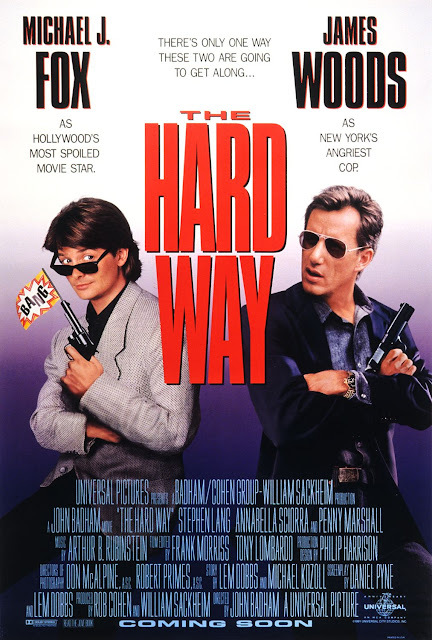 Review The Hard Way (1991): Underrated action comedy and a true classic if you ask me! The Hard Way is a favourite of mine. It impressed me the first time I saw it in the cinema and it still does even after having seen it many times now. So it is kinda curious that this film has not been getting the recognition it deserves. The Hard Way masterfully combines action with comedy and is one of the best buddy cop movies around. It was a brilliant move to pair up James Woods, a hard boiled cop named John Moss with Michael J. Fox, who plays big movie star Nick Lang. Nick Lang is tired of doing big and crappy blockbuster films and wants to become a character actor. To increase his chances of getting an important role he wants to ride along with John Moss who he idolizes because for Nick he is the real deal. Moss of course is not too happy with this idea especially since he is forced to drop an important case he is working on. This case involves The Party Crasher played by Stephen Lang (Avatar, Crime Story). This villain is not fully fledged but whenever he appears on the screen you know that bad things are going to happen. Woods always dependable also at times is clearly hamming up the comedic side of his character but that hardly matters since his tough cop routine blows every flaw and mistake out of the way. There is one scene in particular that epitomizes the coolness of the actor that is James Woods and something only a few can pull off convincingly. Fox again proves his comedic genius and riles up Moss perfectly. Apart from the great chemistry between the two leads there is something that makes me very nostalgic about this film. I think it's the atmosphere and the way this film is shot. For me The Hard Way feels like an Eighties film that got released a little too late. Almost every element of movie making clicks for me except maybe the little role reserved for L.L. Cool J. His song mama said knock you out certainly is one of the highlights in the film but the rapper himself is clearly out of his league. The Hard Way is a film that you can enjoy time and time again and therefore a true classic. If you haven't done so by now then please watch it. It easily puts other films in the genre to shame.